What is Inverter Technology and how is it different from Non- Inverter Technology? An inverter is a device for converting frequency. The technology is used in many home appliances and controls electric voltage, current and frequency. Inverter air-conditioners vary their cooling/heating capacity by adjusting the power supply frequency of their compressors. An inverter type air-conditioner adjusts the speed of the compressor to control the refrigerant (gas) flow rate, thereby consuming less current and power. An inverter has precise temperature control and as the set temperature is attained, the unit adjusts its capacity to eliminate any temperature fluctuations. Non-inverter air-conditioners stops and starts repeatedly. The power consumption and current goes down when the operation stops, but it goes up sharply at the time of restart and thus it has high average power consumption and temperature variations. As a result, inverter airconditioners are more energy-saving and comfortable than non-inverter air-conditioners. Let’s take an example of 1.5 Ton AC. Inverter AC can work from. 3 to 1.7 ton based on cooling requirement. Non-inverter AC can work at 1.5 ton only (fixed capacity)*. Inverter air-conditioners are able to vary their operating capacity. Non-inverter air-conditioners can only operate at a fixed capacity. Diagrams are used for illustrative purpose only; actual conditions and scenario may vary from the one shown. What are the benefits of Inverter Air-Conditioners? Thanks to its smooth rotation, the swing compressor decreases friction and vibration. It also prevents leakage of refrigerant gas during compression. These advantages provide quiet and efficient operation. Daikin calls an inverter model that is equipped with a DC motor as DC inverter. 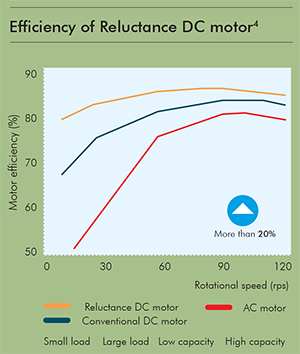 A DC motor offers higher efficiency than an AC motor. A DC motor uses the power of magnets to attract and repel to generate rotation. A DC motor that is equipped with power neodymium magnets, which enable even greater efficiency, is called a reluctance DC motor. 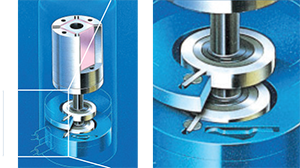 The DC motor allows fine rotation control, which reduces energy consumption. 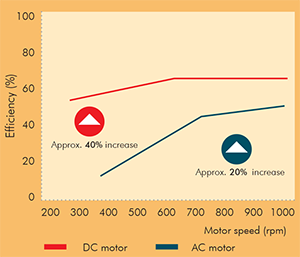 The motor also provides improvements in operational efficiency of up to 40%, compared to AC motor. These improvements are particularly noticeable in the low-speed range. Daikin DC inverter models are equipped with the reluctance DC motor for compressor. The reluctance DC motor uses two different types of torque, neodymium magnet1 and reluctance torque2. This motor saves energy by generating more power with a smaller electric current than AC or conventional DC motors. 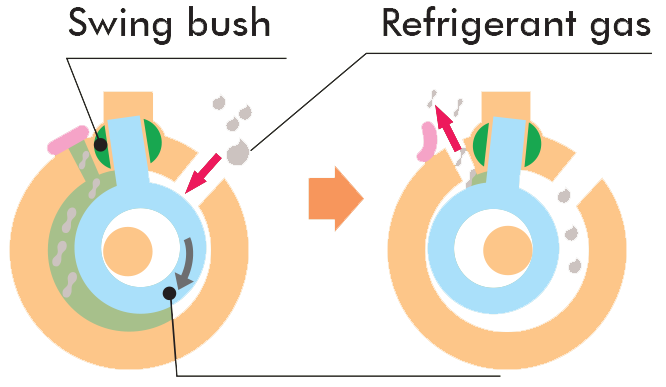 Daikin’s internally embedded neodymium magnet generates strong magnetic field and high torque resulting in high operational efficiency with less electricity consumption. It is more efficient at low frequencies most commonly used by air-conditioners3 improving efficiency by approximately 20%. 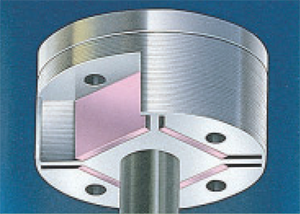 Neodymium magnets are used in the pink-coloured area. The swing compressor can reduce operational vibration and sound because its piston moves smoothly inside the compressor. Neodymium magnets are approximately 10 times stronger than standard magnets. The use of neodymium magnets in Daikin compressors enhances their performance*. Besides, it helps to improve the frequency range used by air-conditioners during periods of stable operation in which air-conditioners operate for the longest periods. Smooth sine wave of the inverter’s electric current eliminates pulsation and high harmonic noise. Highly effective inverter, that can generate the control signal which is closer to the sine wave, thus helping in better efficiency.